How do you prevent Emotional Neglect in your marriage? Fortunately, it’s quite easy. But unfortunately, it’s also easy for Emotional Neglect to take over your marriage, leaving one or both partners feeling empty and alone. All it takes is for one or both of you to grow up with it in your family. When Emotional Neglect happens in a marriage, it doesn’t look the same as other relationship problems, like conflict or fighting. Instead, it’s more likely to look like nothing. Failing to notice when your partner is upset. Ignoring the problems between you in hopes they will go away on their own. Keeping your festering anger to yourself. Failing to notice or respond to your partner’s emotional needs. Emotional Neglect in a marriage is like a quiet monster hiding under the rug. It’s not a “problem” so much as an empty space; an absence of some essential ingredient that no one knows about, but everybody misses. If you or your partner grew up in a family that was blind to the feelings of its members, there’s a good chance that one or both of you didn’t have the chance to learn what true emotional intimacy is. Emotional intimacy requires emotional work; like paying attention to your own feelings and the feelings of the other person, being willing to fight things out even when it hurts, and being vulnerable to the other person: all things that are NOT done in an emotionally neglectful family. All things that are NOT learned by the child growing up in it. As a specialist in marriage therapy, I have worked with hundreds of couples, many of them experiencing Emotional Neglect in their relationships. Important topics, not only negative ones but maybe even positive ones too, are not talked about. One or both partners end up feeling deeply alone in the marriage. Gradually, over time, the two partners drift apart. In these ways, the emotionally neglectful marriage gradually emotionally starves its members. Some husbands and wives feel it happening to them, while others seem to go through their days blissfully unaware. One thing is clear: if the Emotional Neglect goes unchecked, it will eat away at the heart of the couple’s love and passion, eroding that magnetic chemistry that brought them together in the first place. They are likely, after decades of living like this, to end up feeling more like roommates than love mates. Make quality time together. Emotional Neglect is not dependent upon the quantity of time. It’s all about the quality. Quality time requires a true connection, like walking and talking about something meaningful; not just taking a walk together. Bring up something you’re worried or concerned or hurt or angry or sad about. Talking with your partner about something that has feelings connected to it will deepen your connection. If you feel lonely in your marriage, tell your partner. The worst thing you can do is try to “protect” your partner by keeping silent about what’s wrong or what is missing for you. Tell your spouse how much you love him, and then explain that you want a more meaningful, intimate connection. 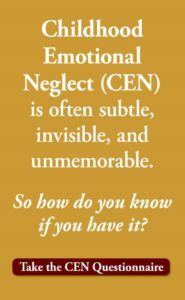 If your spouse has no idea what you mean, have her read about Childhood Emotional Neglect on this blog or EmotionalNeglect.com. If she begins to understand what this means, and how it applies to her, it will open doors for you and your spouse that you never imagined were possible. Strive to notice when your partner is upset. Address the problems between you in a direct and honest, but caring and compassionate way. Accept that conflict is a healthy part of every strong relationship. Voice your anger to your partner so it will not have a chance to fester. Do your best to notice and respond to your partner’s emotional needs. 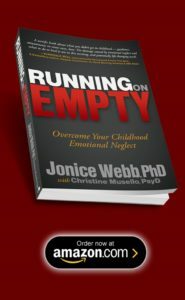 Usually invisible in your childhood and in your marriage, Emotional Neglect has the power to drain your energy, dampen your joy, and make you feel disconnected, lost and alone. How do you prevent Emotional Neglect in your marriage? Ask your partner for help. That is what true love is all about. 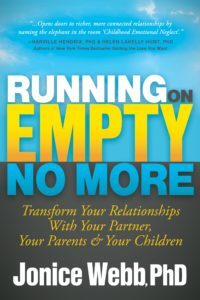 To learn much more about Emotional Neglect in marriage, how it looks and how to heal it, see Running On Empty No More: Transform Your Relationships With Your Partner, Your Parents & Your Children. I see the importance of tuning into your spouse’s feelings. However, when your spouse chooses to have a negative perspective of life as the fuel of her feelings, and when she chooses to blame you for most of the things that she sees are wrong in the marriage, it is scary to try to tune into her feelings. It’s scary because you know that every time you ask “what’s wrong?” she will reply, “you did x and I feel hurt by you.” Over time you find out that you do so many things wrong that it eats up your confidence and you end up convincing yourself that you must be a very unfit person that inadvertently causes so much pain to the person that you’re supposed to love. Therefore, you must change who you are. How can you love yourself if you constantly bring so much pain to your spouse? I think the crux of this discussion would be to determine what x is. The definition of x will be different for the spouses. It’s very hard when each movement you do, each sentence you say, each decision you make is defined as x by the other person. Perhaps compromise on the definitions of x would be an option? Or simply not take every criticism you hear about yourself personally and take it as an opportunity to change into this being that will make your spouse happy? This being that obviously I’m not. Do I not deserve to be loved the way I am? Dear Paul, you ask a good question but I cannot answer it in this way. All I can say is that I strongly recommend you and your wife go to a recommended couple’s therapist. Dear Leigh, I’m sorry I just responded to your email about this earlier today. I’m usually much quicker to reply but I was away for a couple of days. Thanks for your patience and please check your email! My fifteen years of marriage is over. Your description of how a once magical love eroded overtime is the exact story of my failed marriage. While I am not perfect, my spouse let anger fester until it was a cancer that had metastasized to many aspects of our relationship. I repeatedly asked what was wrong, if something I had done caused anger, frustration or distress and was acused of being a nag and looking for trouble. When I expressed frustation and resentment, I was berated for being negative. It was painful to walk away, although I feel significant relief. I believe the divorce was preventable, but my spouse was unwilling or unable to fight for us. Keep up your good work and I feel affirmed reading your posts and website. I’m sorry you went through that! I hope you’ll keep working on making yourself stronger now that you are out of the marriage. All my best wishes to you. A lot of times when a person won’t connect with the spouse, it’s because the person is a narcissist, in which case he/she would not be reading articles like this. The narcissist is not interested in feelings or emotions and so it is important for the spouse who is feeling neglected to be able to identify the signs of narcissism. Hi Freyda, I think there are many reasons that people won’t connect with their spouses. A very common one is Childhood Emotional Neglect. And I agree that sometimes it can be narcissism but then there are definitely other signs to indicate that. Thank you for your comment! Thank you for this comment. How do I know I’m not a narcissist? I started reading your book and I feel strongly that I was emotionally neglected as a child. My marriage is on the rocks and I want to so badly to give him vulnerability by being to talk to him about what I’m feeling. Honestly, most the time I do not even know what my true emotions are so I just say everything is fine when they’re not. I love my husband but I don’t show it the way he needs it. I’m just afraid that if he knew how I truly feel that it will upset him then eventually leave. It’s difficult to get out of that mindset because he really wants to know my true emotion and him not knowing is what’s going to drive him to leave.